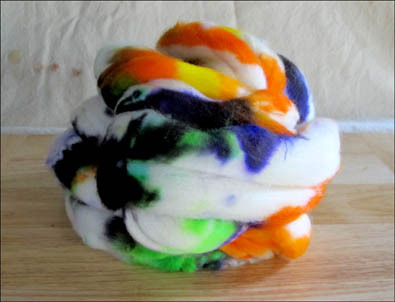 This colorway is a spooky mix of Mostly natural cream, orange, black, purple, googlie green, and yellow. Super puffy heart fluffy roving! Spins up beautifully! Is super soft, and drafts like a dream! Hand Washing and Drying of spun yarn recommended!